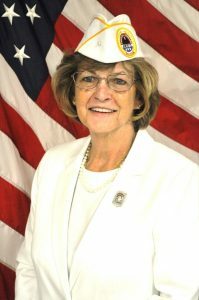 Barbara A. Valley of Danville, Ohio was elected AMVETS National Ladies Auxiliary President on August 11, 2018 in Orlando, Florida. She is a life member of Auxiliary #95 in Mount Vernon. Her theme for the year is “PUTTING VETERANS FIRST”. Good afternoon from beautiful, breezy Maryland! Lots of updates are being posted to our website over the next few days and they include a revised Honorary Member form (FORMS tab), updated PNP and Department Officers Listing (LISTINGS tab), updated files under the SACKETTES tab, 2019 Americanism Seminar brochure (THIS AND THAT tab). Several new files can be found under the NEC/CONVENTION tab. Please note – there are a limited number of tickets available for the Belle of Louisville dinner cruise. Sybrena Bullock is the contact person for the tickets and she can be reached at sbullock@amvets.org or 301-683-4006. I anticipate the Convention Digest being mailed next week. It will be posted on line when available and you will be notified. Auxiliary Headquarters will be closing at NOON on Friday, April 19, 2019. Following a software update from Adobe, there has been a change in how you use the forms. Going forward, you must save the form to your computer before you fill it out. If you complete a form before saving it to your computer, it will save a blank copy and your completed form will be lost. To save the form to your computer, you need to open the form and click download. A box will pop up and ask where you would like to save the file. You will need to select a location to save the file such as “documents”, “desktop”, etc. Once the document is saved to your computer, you will need to then open that file (the one you saved) to fill in the information. You can then save this file and the information you input will remain on the document. If you wish to keep your blank document but save the completed document as well, you will need to select “Save As” which will allow you to give the file a new name and select a file location to save it to. Doing this will keep your blank file intact and will also give you the completed copy as well.